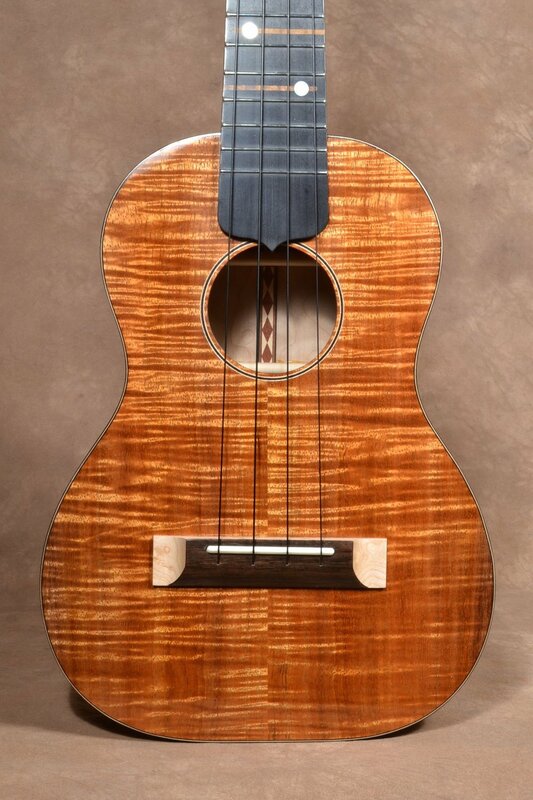 Two beautiful and sonorous woods joined together is the basis of this outstanding tenor size ukulele. The top is a super curly piece of Koa and the body is a heavenly example of Quilted Western Maple. An edge binding of Ebony and Maple separate the two and the neck is a piece of Curly Western Maple. Black Ebony is used for the fingerboard which has maple inlays and big Mother of Pearl dots as fretmarkers. The pin thru bridge is maple and ebony. Glossy lacquer finishes off this excellently crafted instrument. Accurate intonation and set-up make it easy to play and 4:1 ratio Peg Head brand planetary tuners make it easy to accurately tune. Not only looking good this tenor has the full warmth and depth of tone that you’d expect from a good instrument along with great sustain. It’s overall length is about 26” and weight is approximately 23 ozs. The instrument comes in a hardshell case.